During our winter theme activities we always like to learn more about animals that live in cold weather climates. We also like to tie in art whenever we can. For an arctic animal theme we learned a bit more about snowy owls. Then we did this simple snowy owl winter craft. 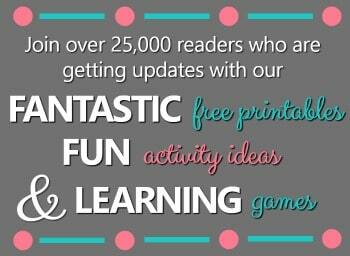 It’s a fun way to recap and discuss the facts we learned along the way. 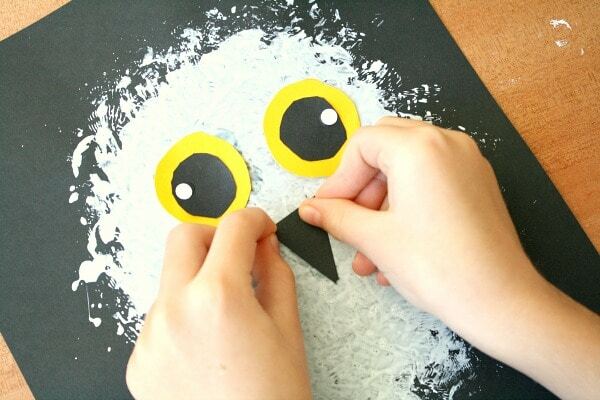 Before starting this art project it’s helpful to read a bit about snowy owls. 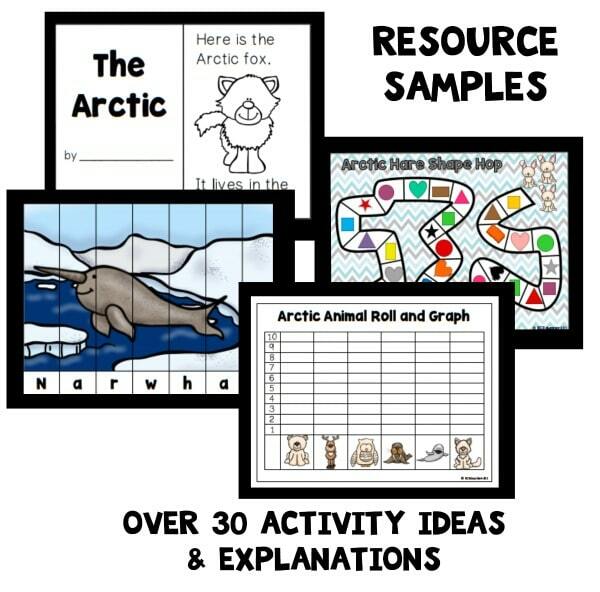 Explore a couple of nonfiction books to learn some facts, and share some stories together too. A few of our favorite snowy owl picks are below. 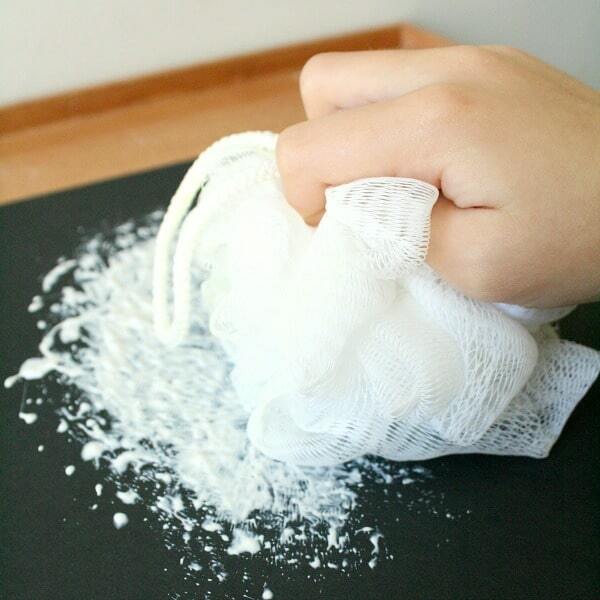 For this art project you’ll only need some basic craft supplies and a shower loofah (Handy tip: Keep a couple loofahs in our craft stash for project like these). 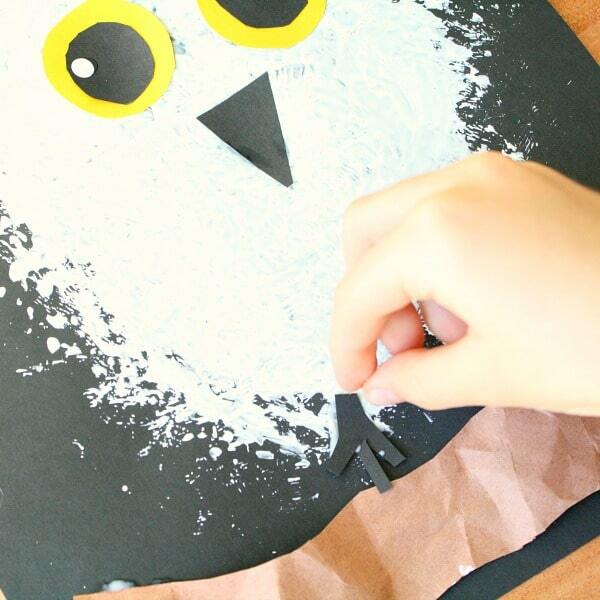 Start this project by having kids use the loofah to stamp paint an owl body on black construction paper using white tempera paint. While the paint dries have kids make the additional features for the art project. This is a great time to look back at your nonfiction books (or images online if you don’t have books) to let your child identify the key features you want to add. We used brown construction paper and did a free cutting activity to make branches for the owl to stand on. Encourage kids to create their own design. There is no “right” way here, so help them embrace it…even the little perfectionists in the bunch! In art class my youngest has been learning about adding texture to her artwork, so she decided to crumple the brown paper. It was a great addition! She traced bottle caps to make the shapes for the eyes. 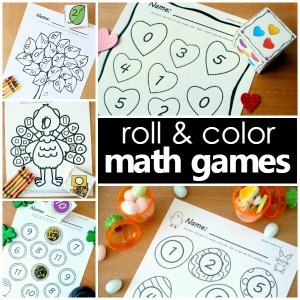 Let your kids choose which caps (or similar objects) to trace. It is a helpful way to discuss size and ordering by size. Cutting circles can be tricky for little hands, but let your kids try their best…imperfection is what makes kid art amazing! Here my little one also had some extra input. Thanks to Art Hub for Kids she loves adding cartoon eyes to her creations lately. 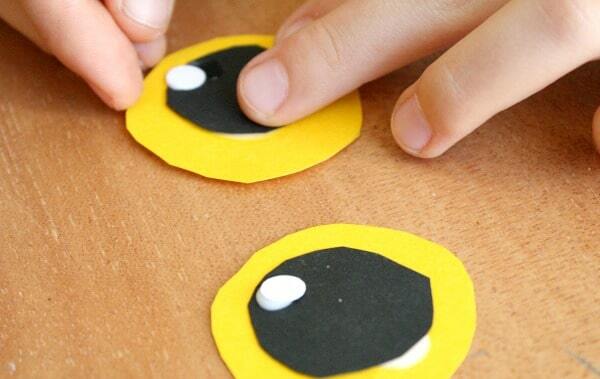 She used a hole puncher to punch little white circles to add to the eyes. Then she cut out a black triangle nose. And she finished up with black feet. 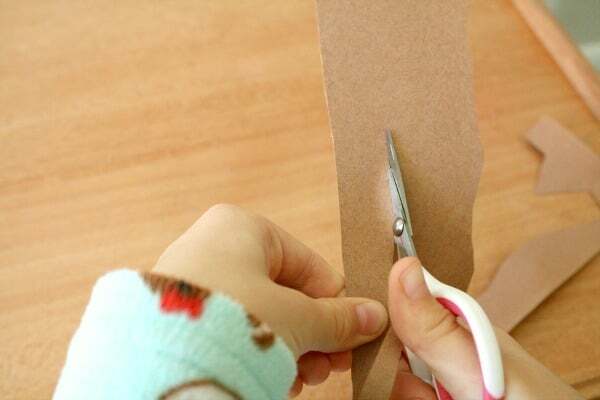 This was by far the most challenging thing for her to cut out, so little ones may ask for a little help along the way. 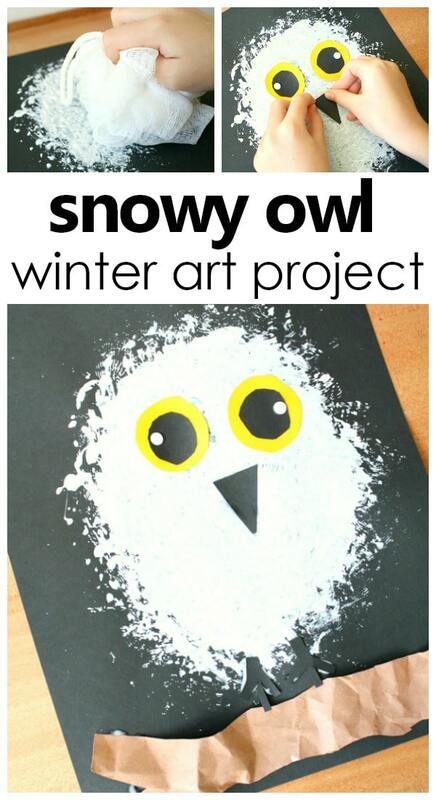 When you’re done hang your snowy owl craft on display or add it to a book of winter art projects. 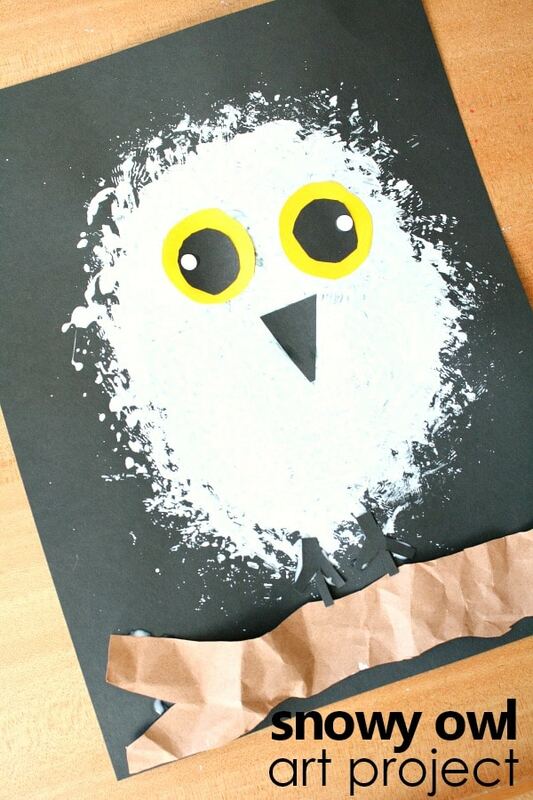 Older children can even write a story to go along with their creations or list some facts they learned about snowy owls.